Through the spring and summer most of my reading has been books dealing with the South in general and Mississippi in particular in the last half of the twentieth century, the era of the struggle for civil rights I still have a few more to read on the topic before I move on to other interests. One of the seminal events of the civil rights era was the admission of James Meredith as a student at the University of Mississippi in 1962. The confrontation at Ole Miss between the determined Meredith, backed by the power of the federal government, and Mississippi’s segregationist state government culminated in a bloody battle that resulted in two deaths and a shattering blow to the strategies of “massive resistance,” “interposition,” and “states rights” that had been employed to stymie the rights of black citizens in our state. 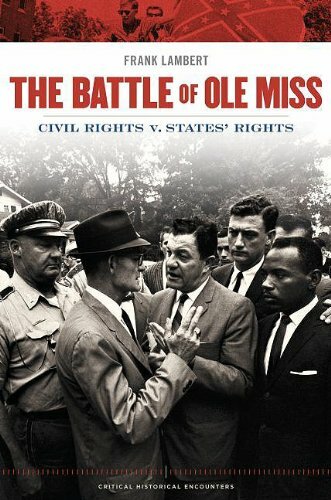 Frank Lambert has authored a gem of a book in THE BATTLE OF OLE MISS: Civil Rights v. States Rights, published this year by the Oxford University Press. If you have any interest in reading about that that troublesome time, you should make this book a starting point. Lambert, who is a professor of history at Purdue University, not only was a student at Ole Miss in 1962 and an eye-witness to many of the events, he was also a member of the undefeated football team at the time, and his recollection of the chilling address delivered by Governor Ross Barnett at the half-time of the Ole Miss-Kentucky football game on the eve of the battle is a must-read. This is a small book, only 193 pages including footnotes and index, but it is meticulously researched. As a native Mississippian and eyewitness, Lambert is able not only to relate the historical events, he also is able to describe the context in which they happened. The book lays out the social milieu that led to the ultimate confrontation. There is a chapter on Growing Up Black in Mississippi, as well as Growing up White in Mississippi. Lambert describes how the black veterans of World War II and the Korean conflict had experienced cultures where they were not repressed because of their race, and they made up their minds that they would challenge American apartheid when they returned home. Meredith was one of those veterans, and he set his sights on attending no less than the state’s flagship university because, as he saw it, a degree from Ole Miss was the key to achievement in the larger society. He also realized that if he could breach the ramparts at Ole Miss, so much more would come tumbling down. The barriers put up against Meredith because of his race were formidable. He was aware of the case of Clyde Kennard, another black veteran who had tried to enroll at what is now the University of Southern Mississippi, but was framed with trumped-up charges of stolen fertilizer and sentenced to Parchman, eventually dying at age 36. And surely he knew of Clennon King, another black who had managed to enroll at Ole Miss only to be committed to a mental institution for his trouble. Even among civil rights leadrs, Meredith met resistance. He was discouraged by Medgar and Charles Evers, who were designing their own strategy to desegregate Ole Miss, and felt that Meridith did not have the mettle to pull it off. Against all of these obstacles, and in defiance of a society intent on destroying him, Meredith pushed and strove until at last he triumphed. But his triumph was not without cost. Armed racists from throughout Mississippi, Alabama and other parts of the South streamed to Oxford in response Barnett’s rallying cry for resistance. The governor’s public rabble-rousing was cynically at odds with his private negotiations with President John Kennedy and US Attorney General Bobby Kennedy, with whom he sought to negotiate a face-saving way out. The ensuing battle claimed two lives, injured 160 national guardsmen and US marshals, resulted in great property damage, sullied the reputation of the university, tarred the State of Mississippi in the eyes of the world, led to armed occupation of Lafayette County by more than 10,000 federal troops, and forever doomed segregation. Ironically, the cataclysmic confrontation that Barnett and his ilk intended to be the decisive battle that would turn back the tide of civil rights was instead the catalyst by which Ole Miss became Mississippi’s first integrated state university. It was in essence the final battle of the Civil War, the coup de grace to much of what had motivated that conflict in the first place and had never been finally resolved. Meredith’s legacy is perhaps best summed up in the fact that, forty years after his struggle, his own son graduated from the University of Mississippi as the Outstanding Doctoral Student in the School of Business, an event that Meredith said, ” … vindicates my entire life.” His son’s achievement is the culmination of Meredith’s singular sacrifice. What Meredith accomplished for his son has accrued to the benefit of blacks and whites alike in Mississippi, and has helped our state begin to unshackle itself from its slavery to racism. You are currently reading THE LAST BATTLE OF THE CIVIL WAR at The Better Chancery Practice Blog.